Most of you would have been to Bangkok once in your life. For those who have yet venture there, i hope after reading this post, you will be enticed to go! I will still follow the rule of thumb like the rest of my blog, so it might be a little long to read. You may choose to simply look at the photos and caption. If something in particular catches your attention, you could then read the elaboration as follows. As easy as 1-2-3 right! Yes, street food. 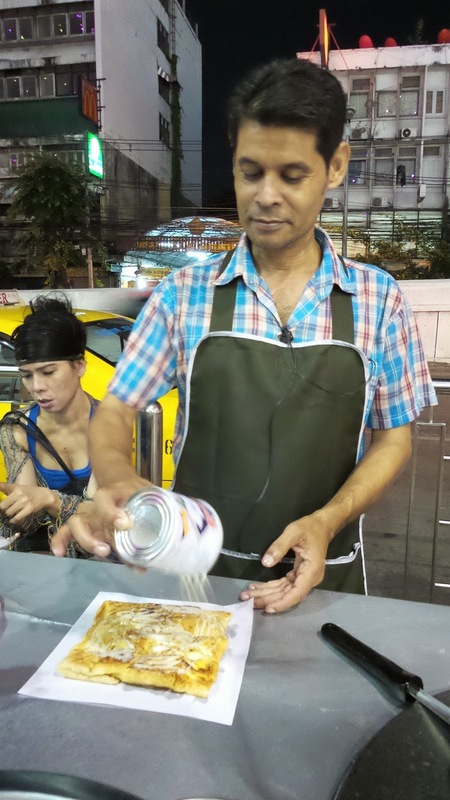 Who would have relate Bangkok to its street food? 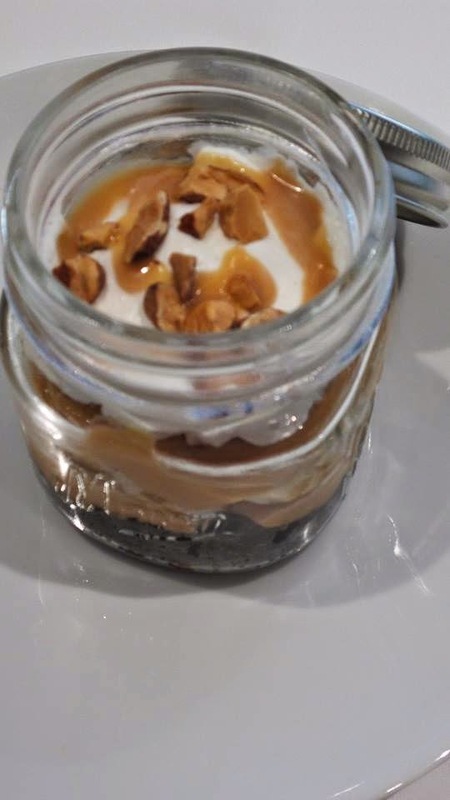 It will be a pity not to give a try to their street food, i have learnt my lesson so i am sharing with you here so you will not regret like i did. I began having a taste of the street food on my 3rd visit in the past 3 years, only to realise how delicious they can get. You will understand why i particularly put this on the top list not that its in descending of ratings/likings, but this naturally would come to my mind first. Located just across Platinum Shopping Malls and a short walk in the direction of Glow by Zinc Hotel. There are usually 2 pushcarts selling the same thing. Oddly, only one of it is found to have a queue most of the time. I have tried both and proven that they taste the same and prices are similar. 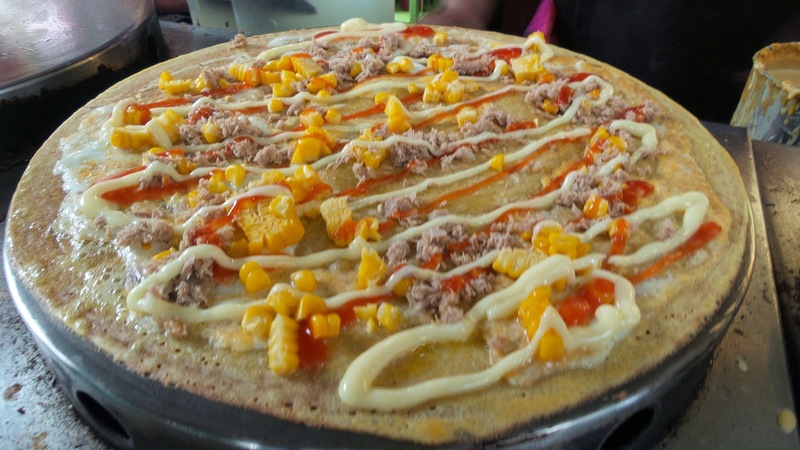 They charge based on the number of toppings you choose to be inside your crepe (besides peanut butter and nutella which cost like 50baht more). 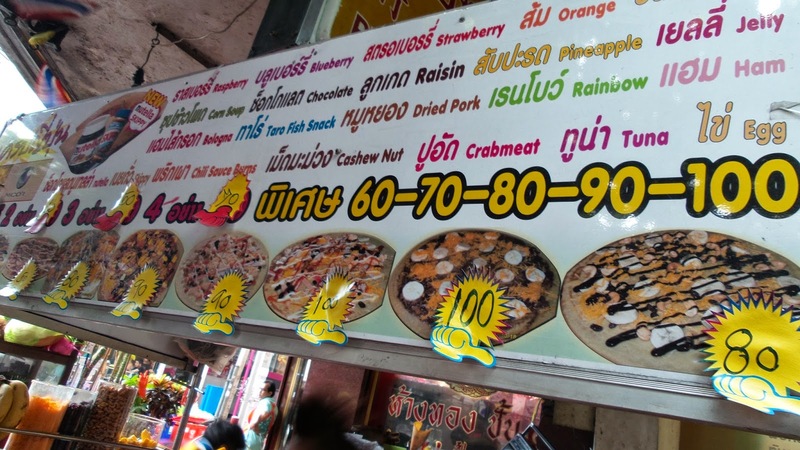 3 toppings = 50 baht, 4 toppings = 50 baht... You can combine savoury and sweet altogether, it really depends on your preference. 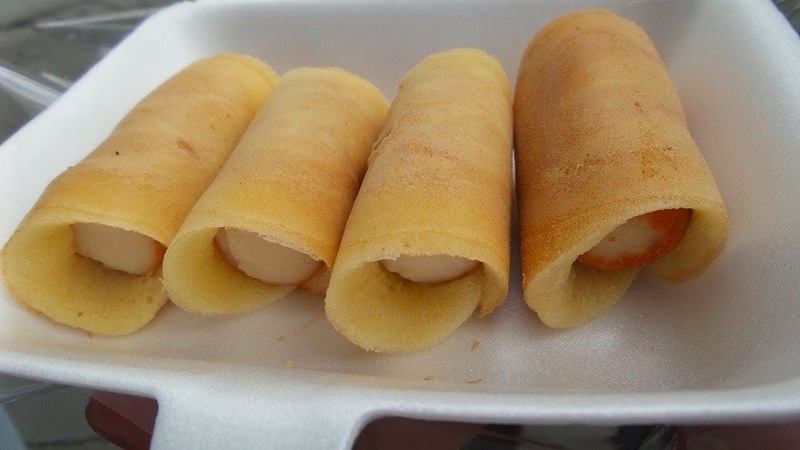 Crepes in SG are a lot more pricey and less crispy and tasty as this. 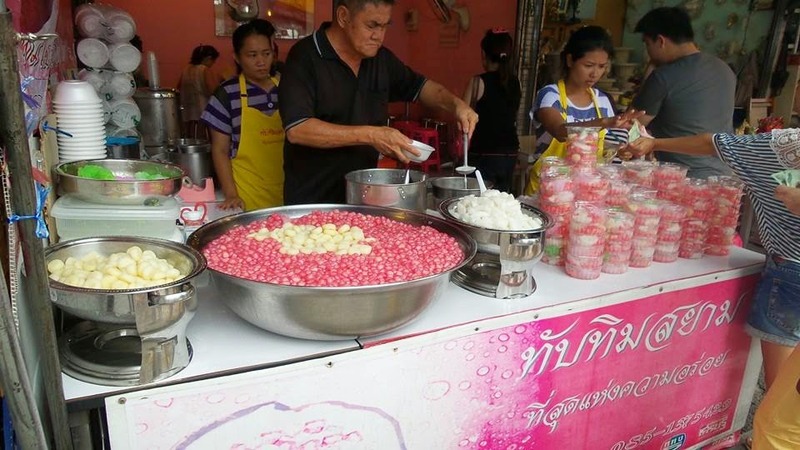 So, eat more while you are in BKK! Think the oyster omelette in SG but crispier on its ends and sprinkled with raw vegetables. 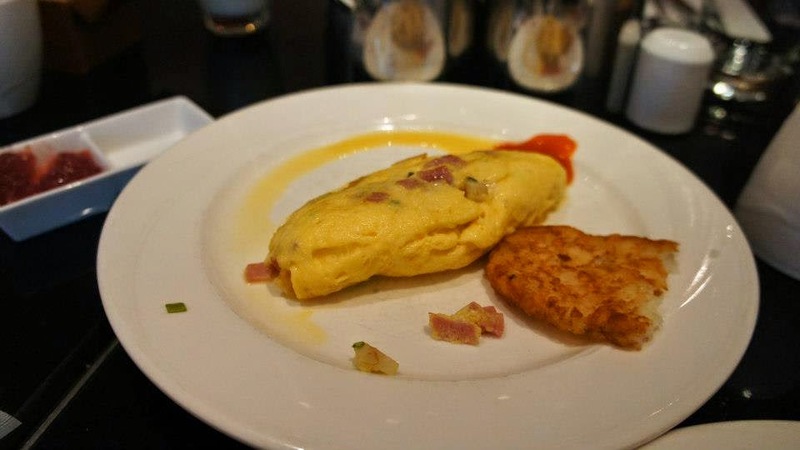 This is the traditional oyster omelette you will get if you order anywhere in BKK. The oysters are really fresh though, i haven't had a bad experience ordering this. I love it for the greens that adds additional crunch to it and make it seem a lot less greasy and arteries clogging. Must Try! 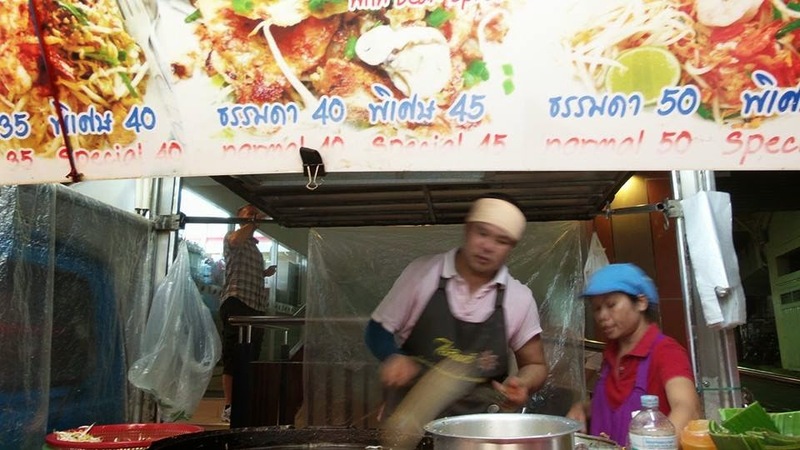 This oyster omelette/ phad thai stall is located near Ratchatewi Station along the road. Look out for a crowd and the cheery cook! When i walked past the quaint little pushcart, i had this urge to try because it reminds me of our Indian food - pratas. Not knowing how to order, i just signaled '1' to the owner and he raised a banana at me, and i nodded. And so i got this banana prata topped with lots of condense milk, chocolate syrup and sugar (optional, unless you want to be diabetic, i would suggest shook your head vigorously). The crisp pancake is best eaten hot before the syrups sips in and turns soggy. This bite-sized pancakes are going to surprise you. Do not just judge it by the cream pumped into it. 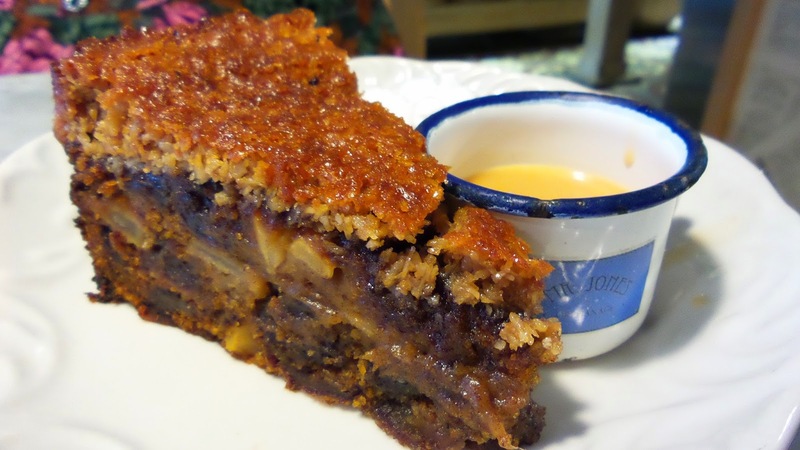 Eat it altogether with the coconut and you will bound to fall in love with it. Unless you dislike coconut to begin with. 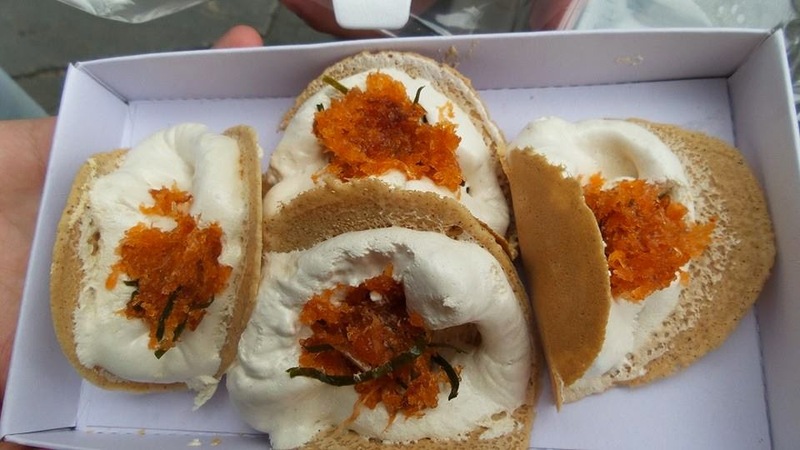 Thai also like to make this into a snack which you might have seen in dried fruit snack shops around Bangkok. Some stores sell it with different toppings or even without toppings (just the cream). So far, the one on the streets outside MBK at night is the best i have tried. 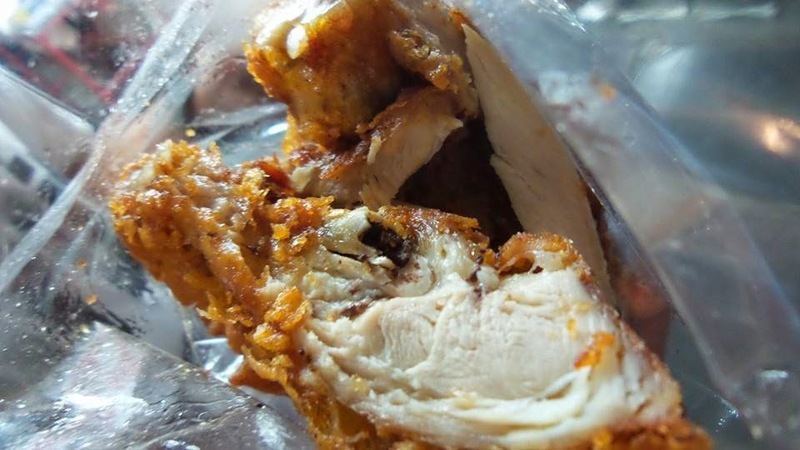 There is several types of fried chicken, the may sell the whole drumstick, or sliced or even just the crumbs. I tried both the whole drumstick, some are huge while the rest are smaller. 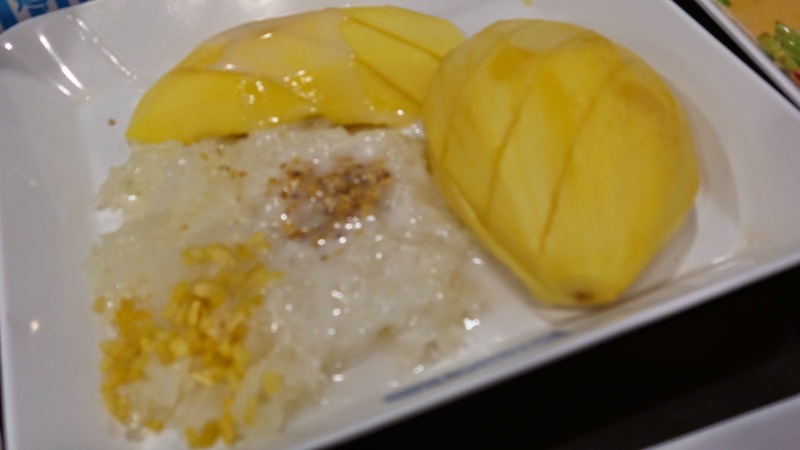 Usually served with their staple glutinous rice which is often tasteless. If you takeaway in a box, perhaps they will give you some chilli which is DAEBAK! 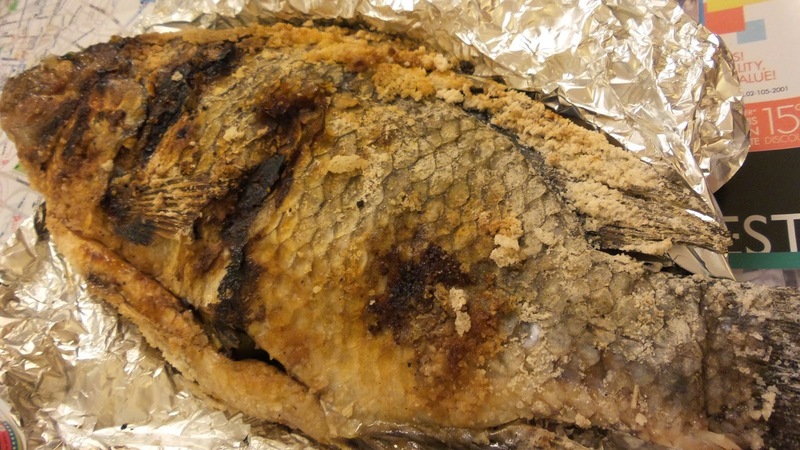 Depending on the size of the fish and where you buy it, the price varies. There are some 'tze char' stalls on the roadside near CentralWorld and they sell really fresh ones. 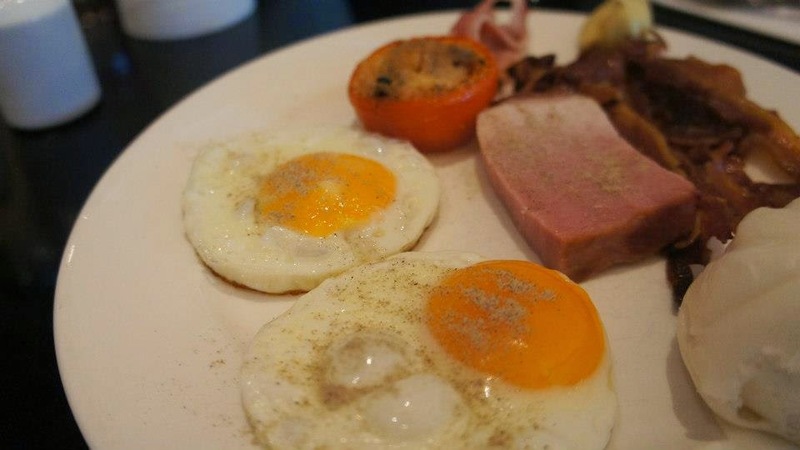 DO NOT eat the skin or let the flesh touch the salt smothered on the skin because it is really salty and disgusting. The flesh itself is really flavourful without any kinds of dips. For the price, you can at most get some saltwater fish or mini stingray in Singapore and won't even taste half as shiok. 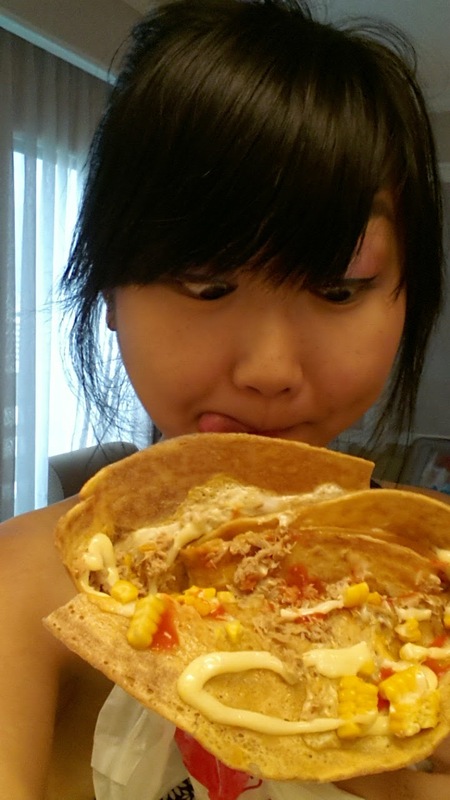 You may choose to takeaway like we did and eat in the comforts of your hotel room. 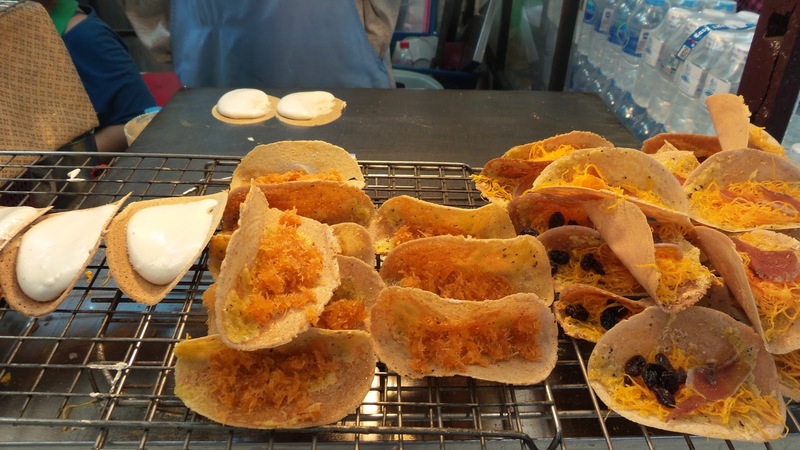 This is commonly found along roadside stalls, we tried the one at Soi 38 (Thong Lor) station and the skin was really crispy. Portion was generous but surely never too much. The meat was tender and cut in chunky pieces. Ooomph SO GOOD! A famous thai food which i never knew till recently. I must admit they are served differently from the pig's trotters in SG. 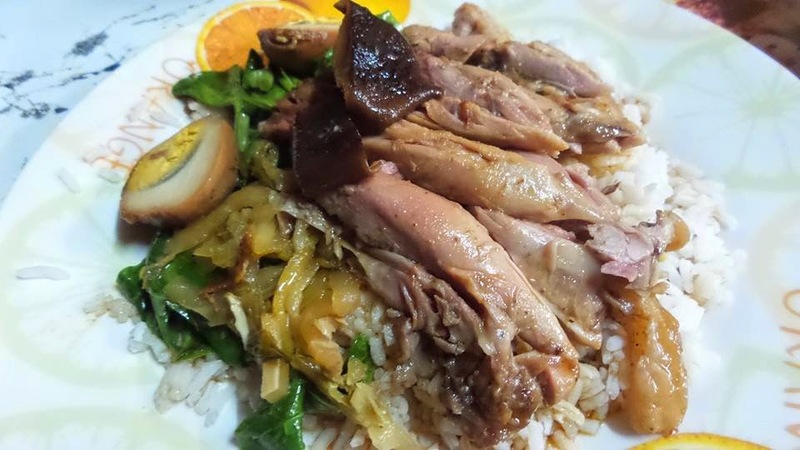 Over there, meat and mostly fat are sliced thinly and topped over a heap of rice and some vegetables and finally, the delicious gravy to make it a perfect main course. Some of you will find the portion too small for a meal, so usually that's just ONE OF the mains you will have. Add anything like fishcake, other parts of a pig or braised egg on your rice to make it more complete. 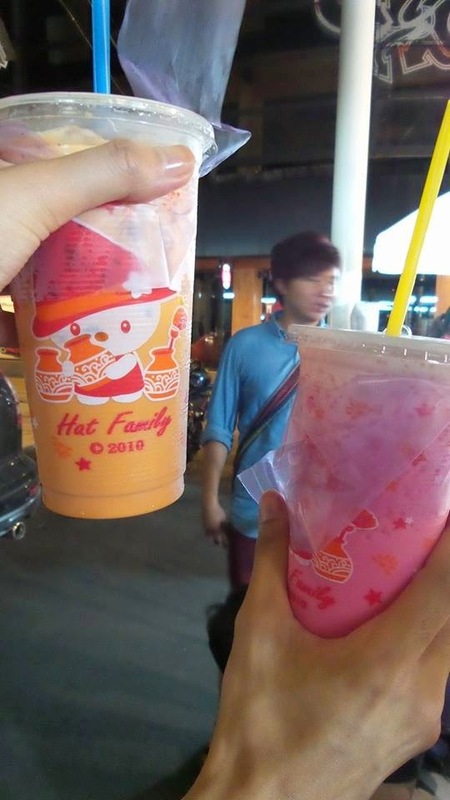 How can i forget this daily dosage of sugar laden beverage that i had when i was in BKK! Who cares about diabetes, thai iced tea comes first ^^ You can find this anywhere on the streets and they will usually understand when you tell them 'thai milk tea iced'. Especially like the one on the streets towards Platinum Shopping Mall as is is poured into a plastic bag of crushed ice before placing in a paper bag. Interesting concept it is. 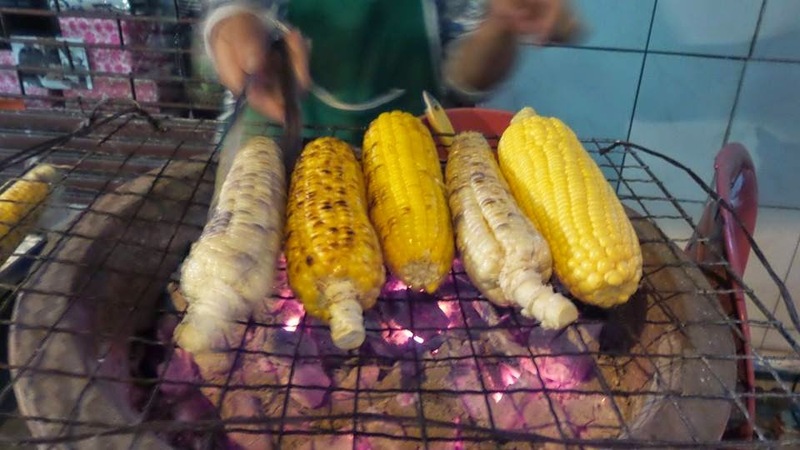 Found anywhere as long as you spot roadside stalls, they will surely have grilled food like sotong, corn, meat etc... Try their sotong because they have various parts and are mostly juicy after BBQing on the grill. I love the corn as usual so if you are a corn lover like myself, do get one on the go. Most of the time, only a pot and some packet boxes are seen on the cart. 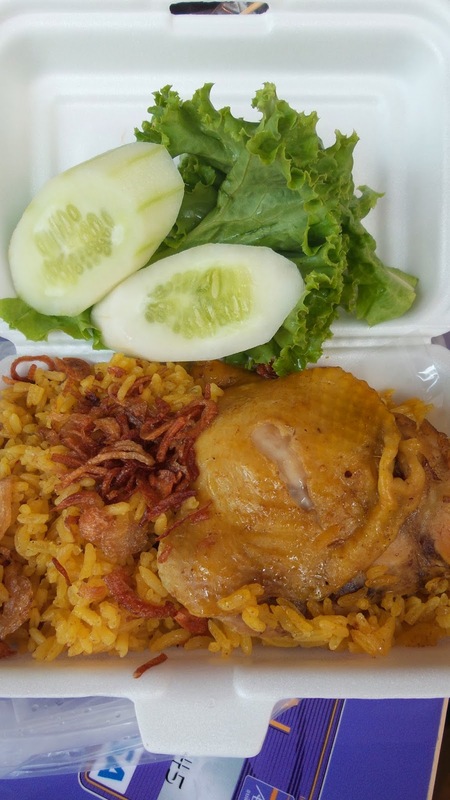 The rice and chicken are cooked together to produce the fragrant chicken baked rice. It actually tastes like briyani but is not cooked using Indian spices. The rice grains are chewy and not sticky due to the long hours of cooking. We had this 2 days in a row before leaving to Singapore. Worth a try! It seems to be a must to have at least a meal at Macs whichever country you go to. 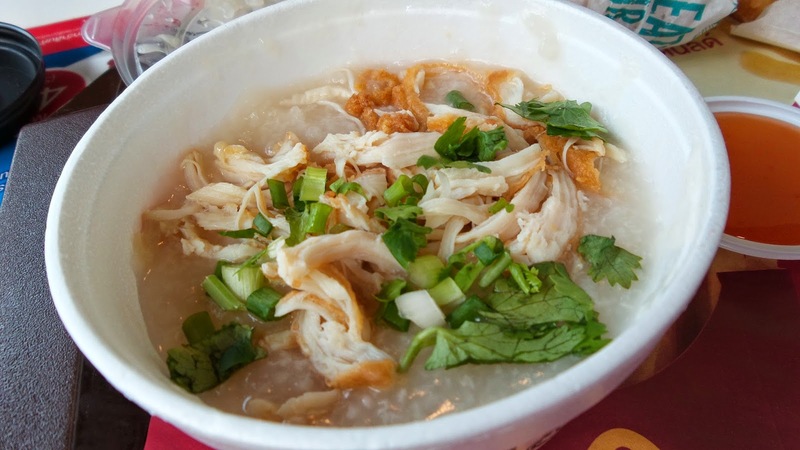 We tried their morning chicken porridge which was a disappointment as it was not hot and too soggy like it has been cooked for days. The lunch/dinner is not bad though, do note that the portion of fries is larger than that in SG. Some of you might be tempted to try the soupy mains on the streets but let me give you a heads up, you might not like it. The herbal duck noodle soup however is the best i have eaten.. 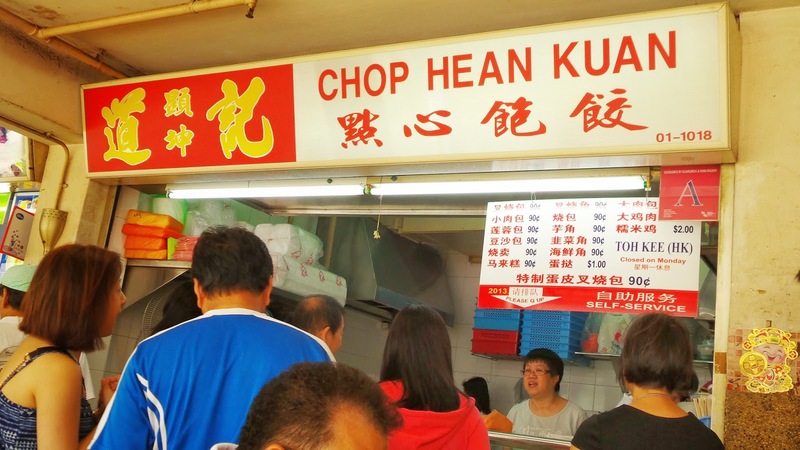 There is this Yen Ta Fo which you might think it's similar to our local Yong Tau Fu. It is similar as the ingredients are mostly made from fishpaste but the greatest difference goes to the soup base and probably noodles. Good thing is you get to choose the noodles and there are quite a few sauces, peanut bits which you are free to add into your noodles. I was disappointed quite a few times with them probably because we are not used to the taste. 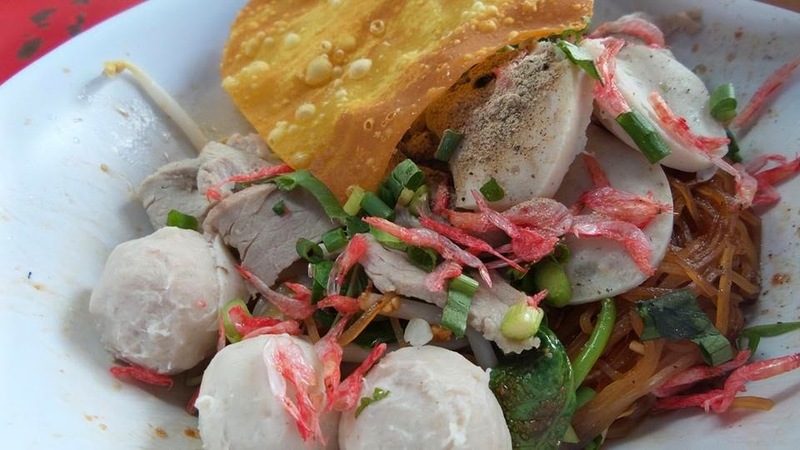 Many say the Sab x2 Wanton noodles is a must try in Bangkok. I have not tried it so there is no evidence if it's good or bad but i must say, if you are used to our wanton noodles with plentiful of black and red sauces, then this is not for you. The handmade egg noodles are cooked briefly before some fish sauce and sugar is mixed in. I believe there is better tasting ones which i have not discovered. Will update this should i find the legendary Soi 19 Wanton Mee! 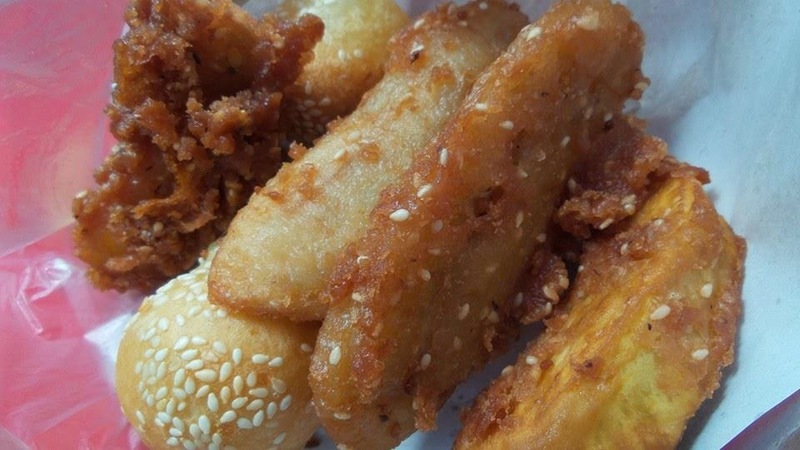 Fried foods are really common along the streets. But be careful if you are particular about hygiene. I have seen flies hovering over the tasty looking fried items on the carts. 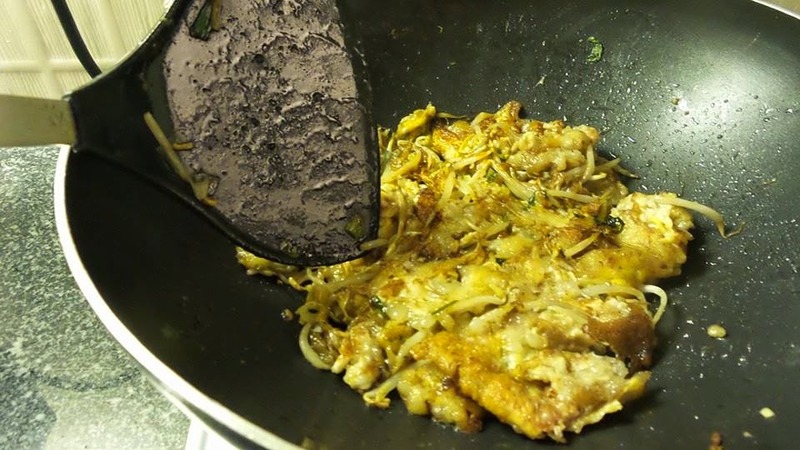 Some stalls fry a second time before serving so that is better in a way but more oily than frying just once. 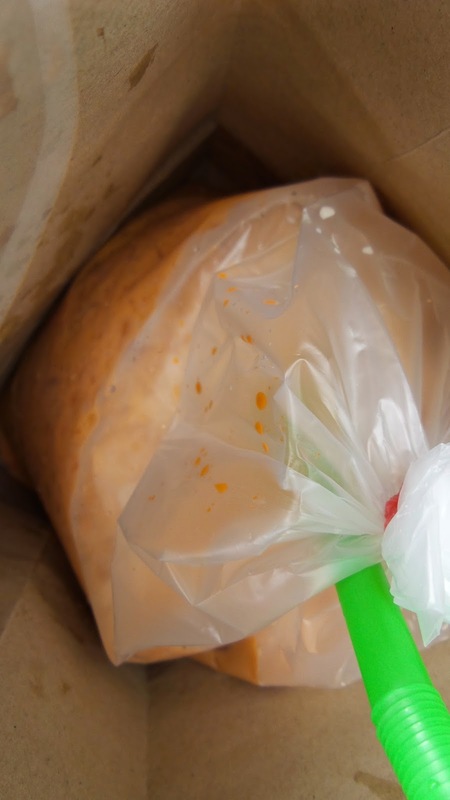 Yet if it is cold from long hours of frying, it can still be really oil laden and sometimes taste bad. 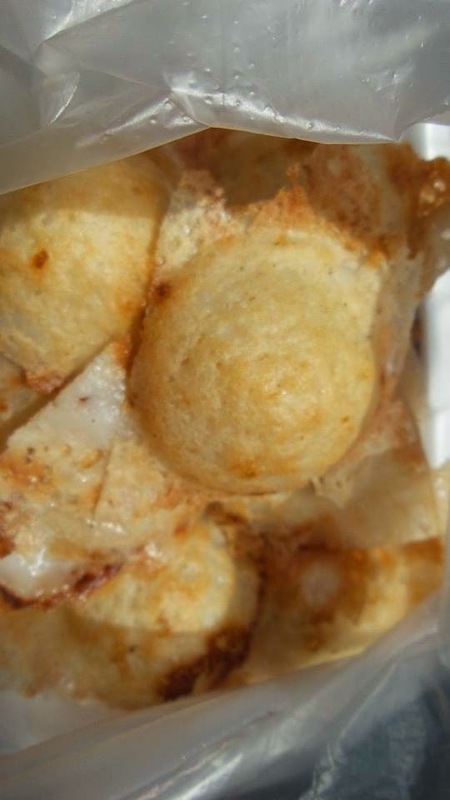 This warm, gooey coconut filled pancakes are served in cute round pieces on a styrofoam box. 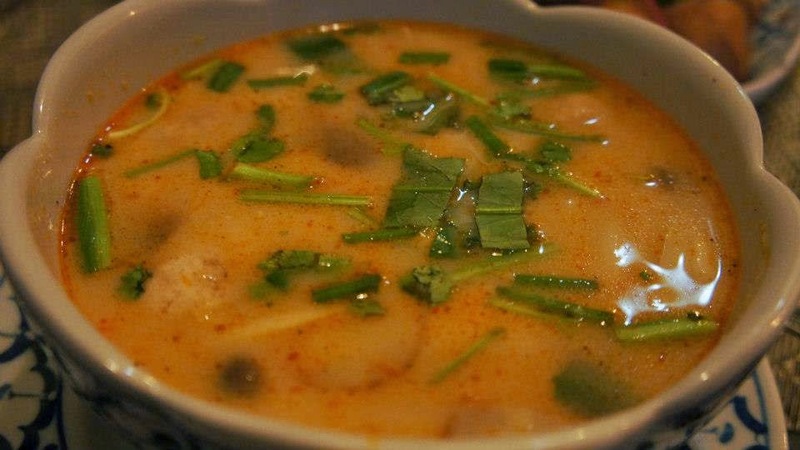 It is slight savoury and slight sweet due to the coconut and spring onions sprinkled in it. Corn bits or even ham can be found inside as well. I actually enjoy this quite a bit but can get jelat if eaten too much. Most stalls cooked a lot and wait for passers-by to buy. Try to get them fresh from the pancake maker! They have a few outlets around Bangkok. Siam Square Soi 5 being the longest existing outlet. Queue is not an uncommon sight so be there early or at odd hours of the day. 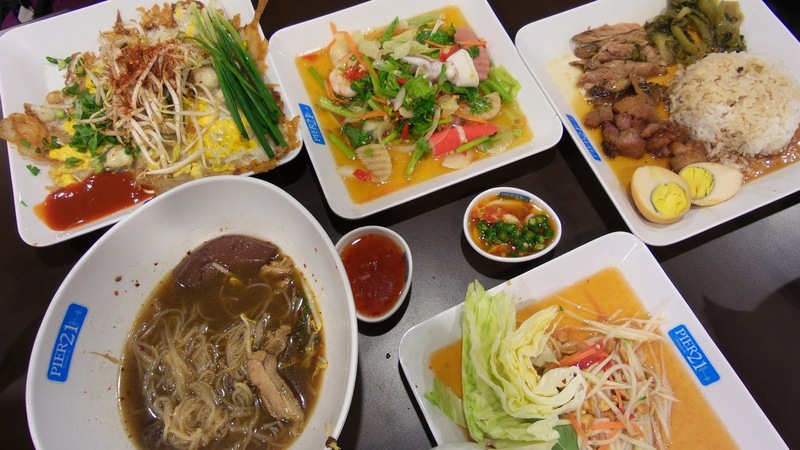 It is a famous thai restaurant and you can expect a few popular dishes which all tables will order. A nice place to dine with friends and family for it is casual and trendy. However, service staffs are prompt but not very attentive. 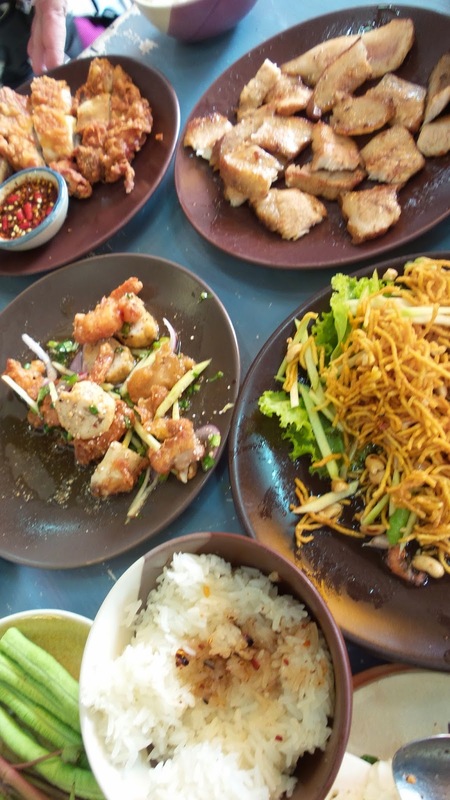 Recommended dishes are the 5 types of papaya salad (som tam thai, tam muah), grilled fish (larb pla tod), fried chicken and the tom saap kraduk moo on (clear tom yum soup). Eat them with the glutinous rice wrapped in a bamboo. I love their food as they are really flavourful! Papaya salad here has more ingredients than those in most places and their level of spiciness is what we call shiok. The fried chicken is marinated with their very own spices before frying and served with thai sweet and spicy sauce. 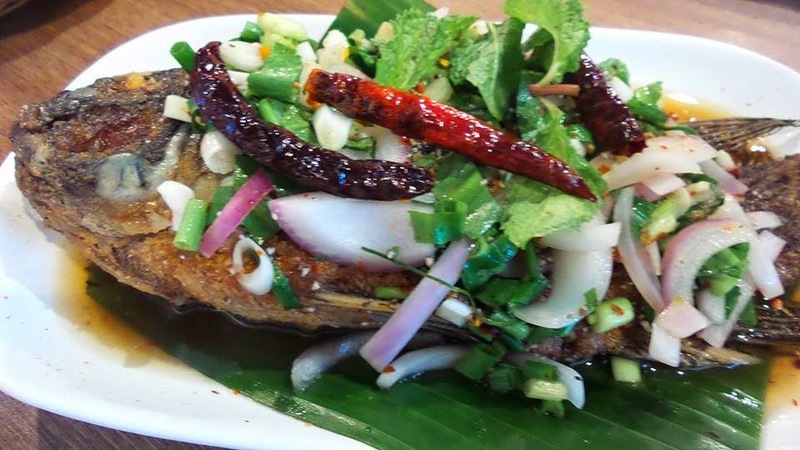 My favourite is the deep fried tilapia before topping with the spicy and sour sauce made from lime, red onions, mint leaves and chilli flakes mixed with fish sauce. Prices here can go a bit steep but it is WORTH IT! Be it in Siam or Chitlom or Asiatique, you are bound to bump into a MK Restaurant. 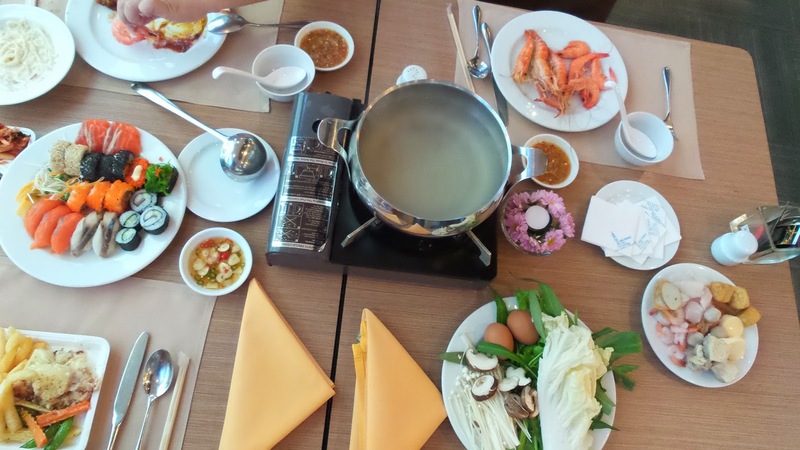 It serves steamboat as their main but there are also dim sums and most importantly, roast meats to sum it all up. 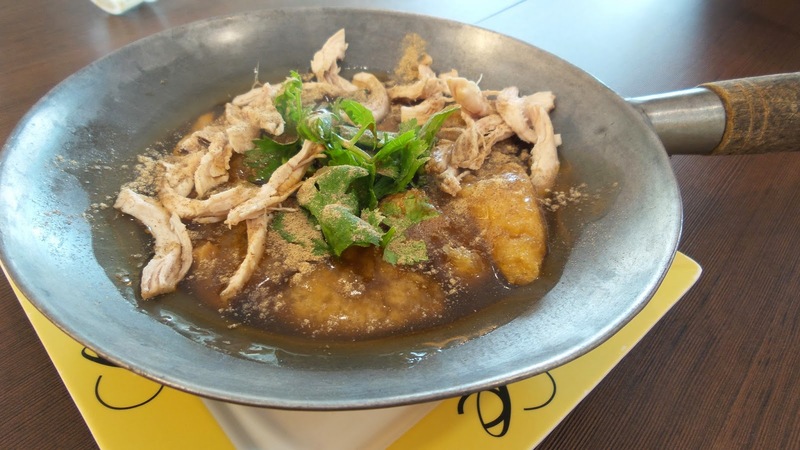 Their roast duck, char siew and crispy roast pork can be served in a platter with their specialty gravy which is bound to make you want to eat it again and again! The chilli sauce here is very shiok! Add the non-spicy chilli padi and lots of chopped garlic for an optimum combination. 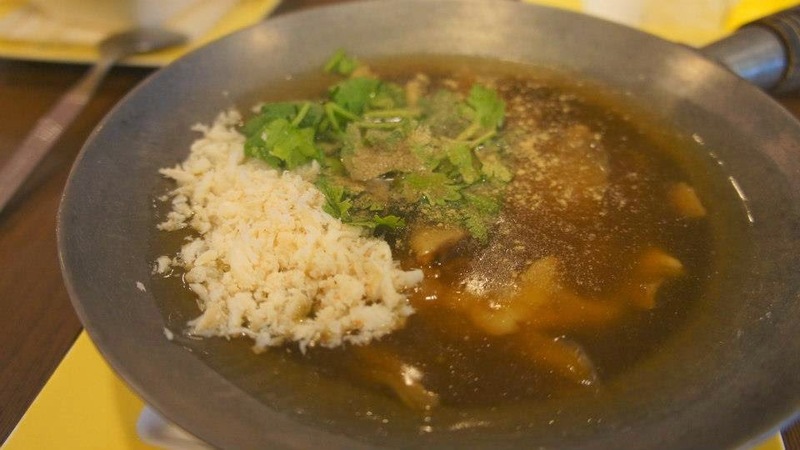 Soup here is standard chicken soup but is very sweet and pleasant on its own. 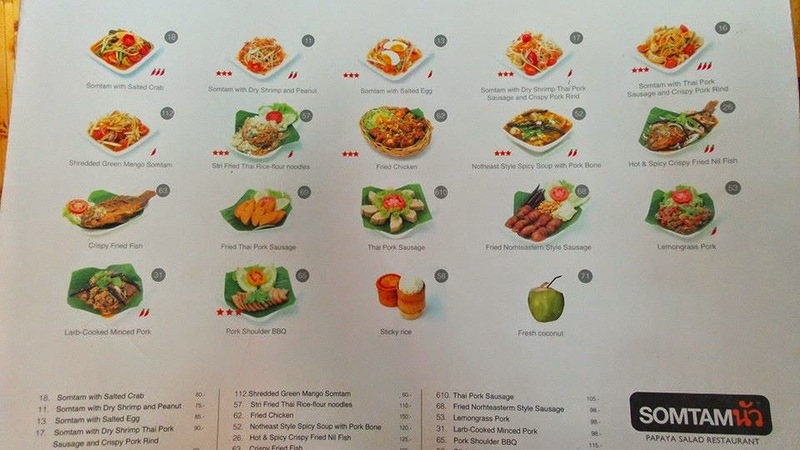 Prices here is on the higher end given how cheap food on average is in Bangkok. Convenient for hotel guests but this restaurant serves one of the best Korean food i ever had outside of Korea. The BBQ selections will make you spoilt for choice and their other main dishes like Bibimbap and garlic fried rice were also very delectable! 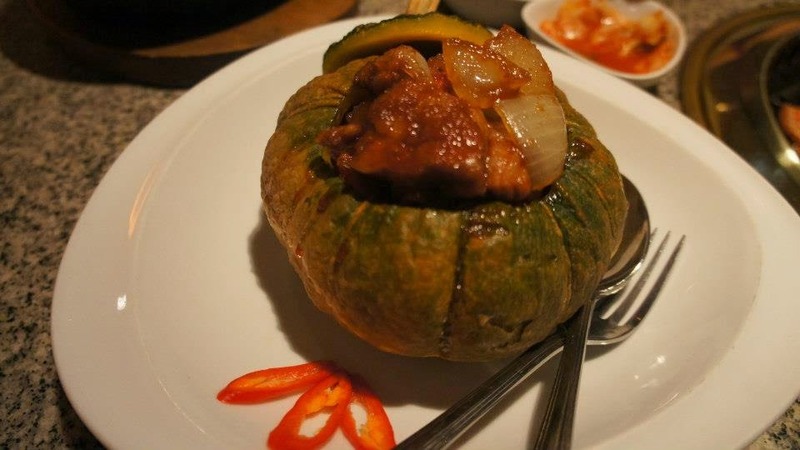 I had this exquisite pumpkin dish served with chicken and steamed for long hours to produce the end result which was made me melt. I always have a weakness for pumpkin but not many places serve the whole mini japanese pumpkin these days. I hope they still have it now! The marinated BBQ meats and seafood goes very well with white wine. A good option for a finale dinner. This restaurant is not easy to find. 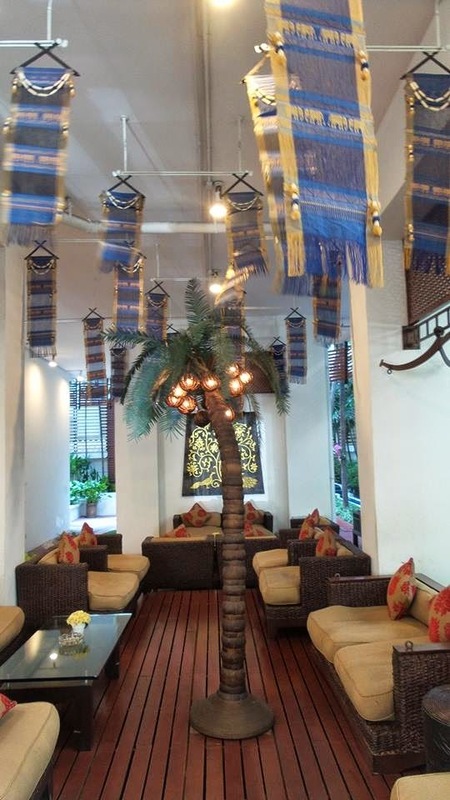 Located at 9 Thanon Charoean Krung Soi 30, it is near Shangri-La Hotel Bangkok. We had to walk a distance from Saphan Taksin Station. The food here, as the name suggest is spicy! 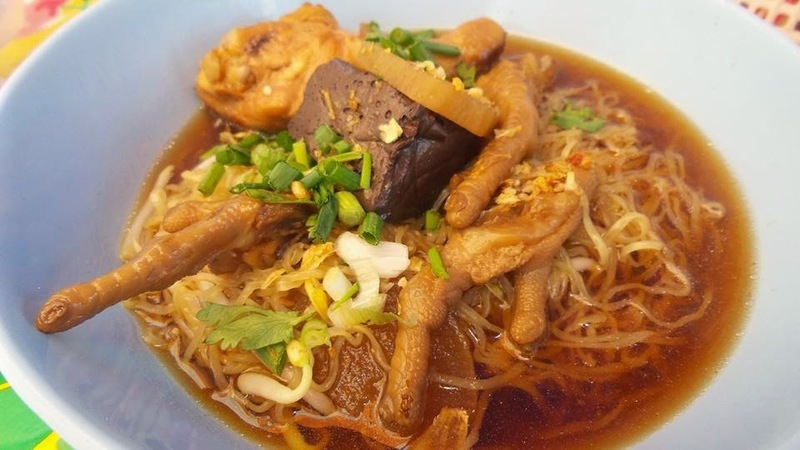 Although the menu is somewhat similar to any authentic Thai Restaurants in Bangkok. Their tom yum soup as i remembered was really spicy! 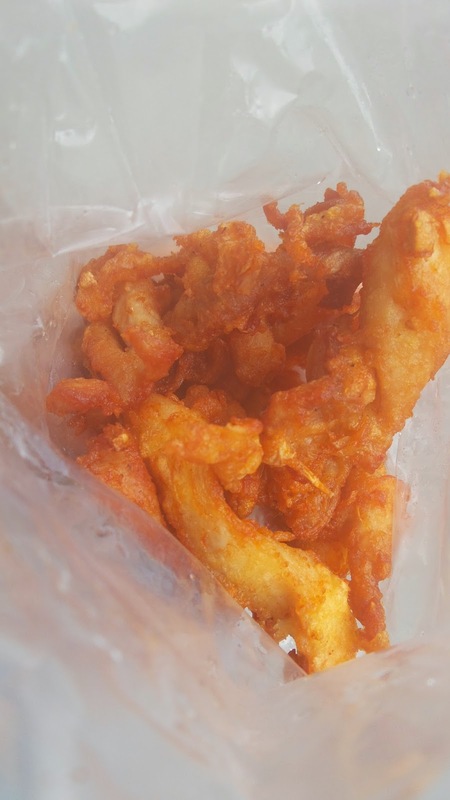 The fried popiah is really delicious, not too oily at the same time. Free flow of rice here for the 'Fan Tong'! :) Not sure if it is recommended to go there without reservations as the restaurant is quite small. However, there was not many diners when we went. Simple but homely cooked food which you can get almost anywhere. Japanese food in Bangkok? Doesn't sound very attractive? 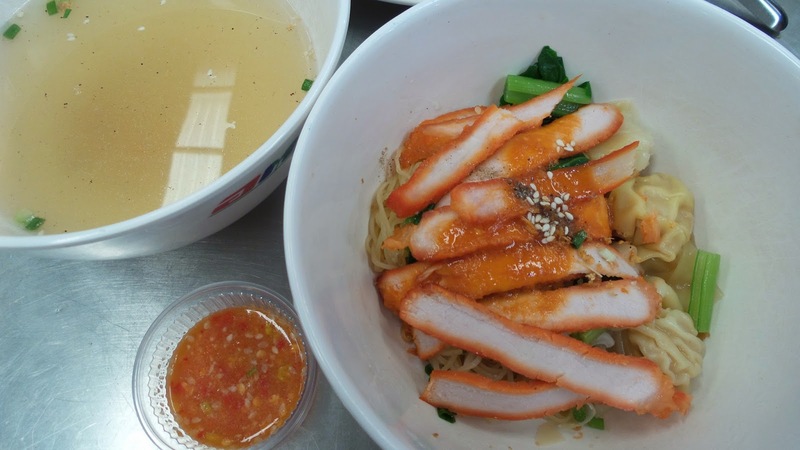 Well, if you happen to drop by at MBK and feeling hungry, there are many eating places to try. Kobune can be one of them if you have a craving. It is considerably cheap for international food in any country. 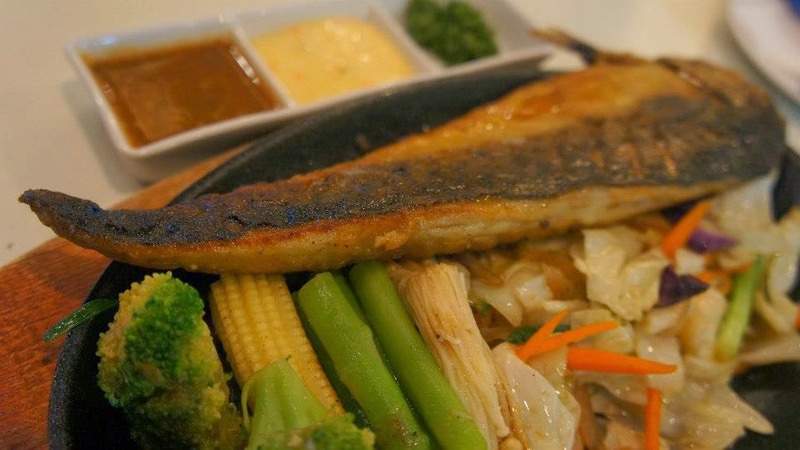 I like their saba fish on hotplate and the stir fried vegetables. 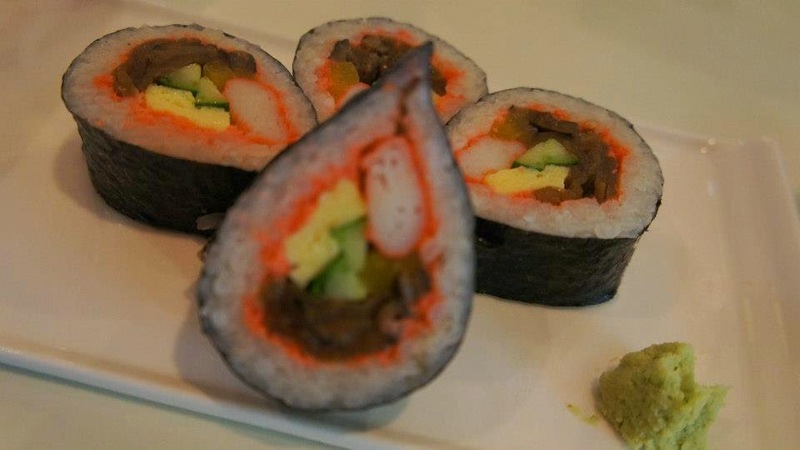 The rice used for sushi and handroll tasted a bit too mushy for my liking. Overall, it is value for money so it was not bad an experience. Service is excellent though! For 1000 baht to dine in a buffet that does not provide a good view, i do not think it is worth it. 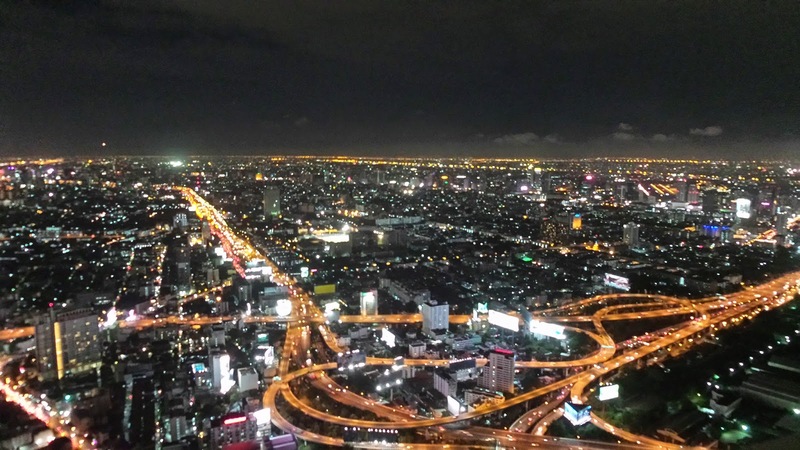 But to be able to go up to the 84th storey rotating rooftop to get a glimpse of the skyline in Bangkok, i should say it is better than the meal itself. Meal times are limited to 2 hours and the food is pretty average. 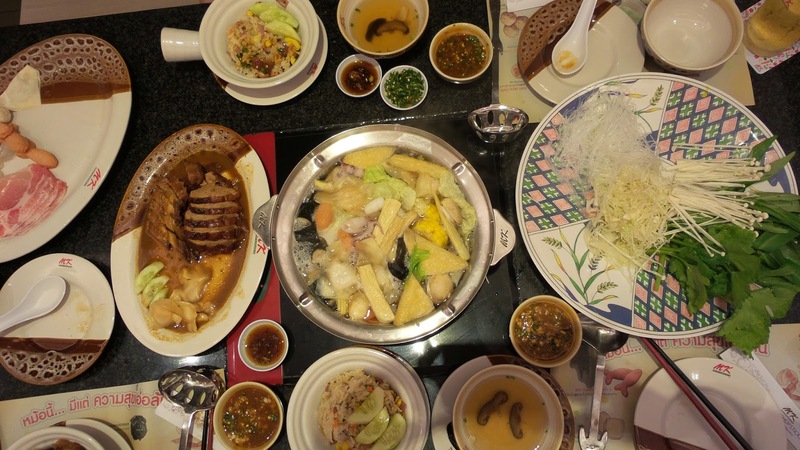 There are hotpot, jap, western, seafood, salad in the selection. I would not suggest spending more than an hour here as the ventilation is not too good. 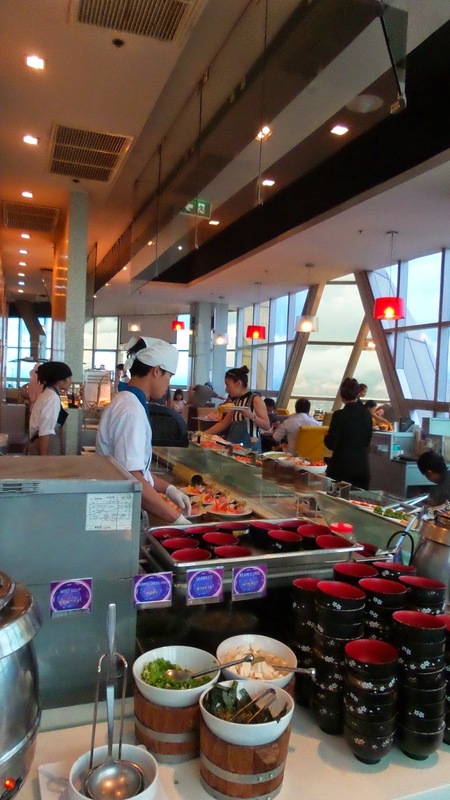 There are other buffet restaurants throughout the top floors of the hotel which you can select. Quite surprisingly, for a top notch hotel like this, wifi is not even available to dining guests. Could be better improved in this area. 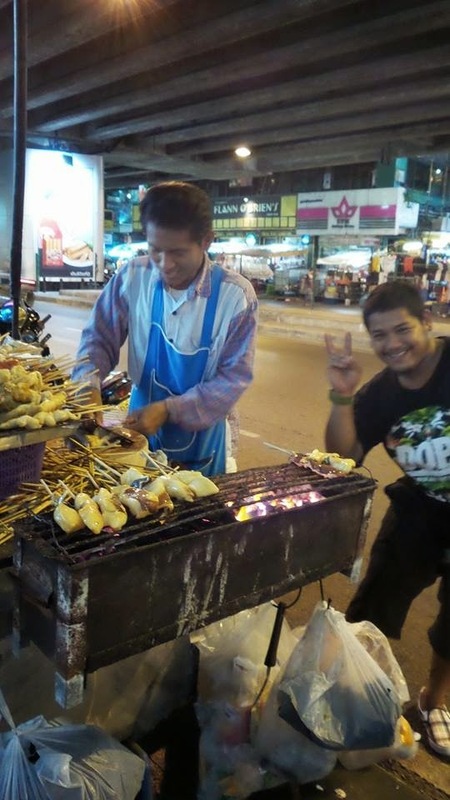 Just a slight walk from Pratunam Market, you can even shop around after the dinner. Preferred timing to dine will be at 5.30pm when the restaurants open so as to catch the daylight view before going up again to enjoy the evening breeze and night scenery. Many might not have thought of going to Bangkok for cafe hopping but this is exactly what i did recently and i surely have no regrets. Just walking past Mr Jones Orphanage will tempt you enough to want to try out this cosy cafe. Located on the 2nd floor of Siam Center, close to the linkway to Paragon Mall, this eye-catching cafe is hard to miss. Serving mostly cakes/ desserts and drinks, it is a place mostly for the young. BEWARE of the rails that stretches throughout the cafe as you might hit your head if you do not bend low enough to move in and out of your compartmentalised seats. The overall concept of the cafe is interesting and attracts people of all ages to visit. 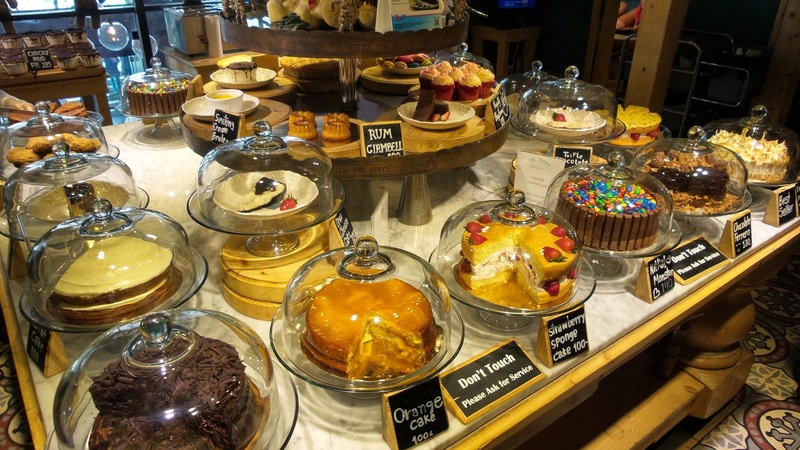 You will be awestruck by the display of cakes stacked like a huge tea set in the middle of the cafe. See below for what we ordered. THEY ARE ALL GOOD! 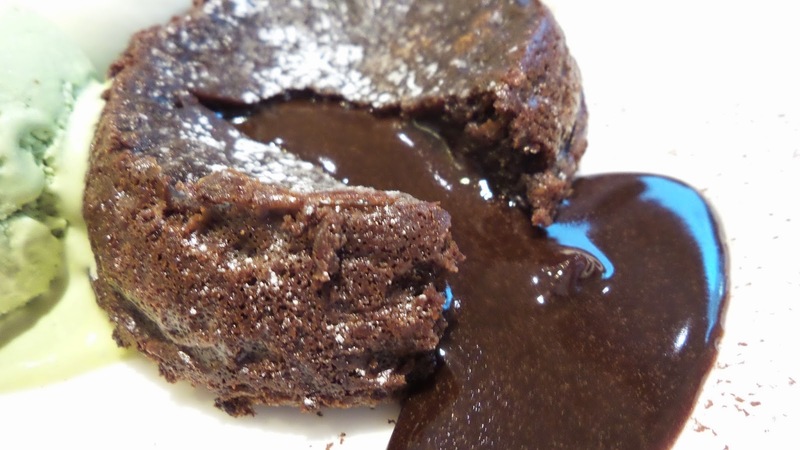 But if you ask me the best, it would be the sticky date pudding. Although it isn't the most appealing cake of all, one bite of it will convince you why this should be the winner. Not for the faint hearted. hahaha. They have a few outlets but we went to the one at CentralWorld L7 right beside the supermarket and foodcourt. Queuing is normal and the queue system will follow very much like Grandma's Restaurant or Xin Bai Lu Restaurant, if you have read my Shanghai posts (1st Week with Bren in Shanghai, Second week of fun and food in Shanghai) uses queue system accordingly to the number of people you have. This cafe is famous for their thick toasts. I really miss the Bread Temptation from China!!! Okay, back to Bangkok ^^ They have free flow of water which was nice on a hot weather like that in Bangkok. 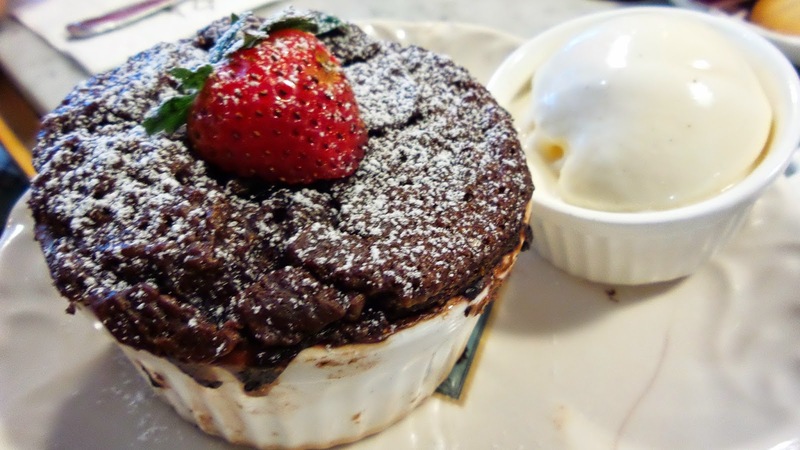 We had the honey shibuya toast and the chocolate lava cake. With a coffee and a Thai Iced Tea and they cost about 700baht altogether. 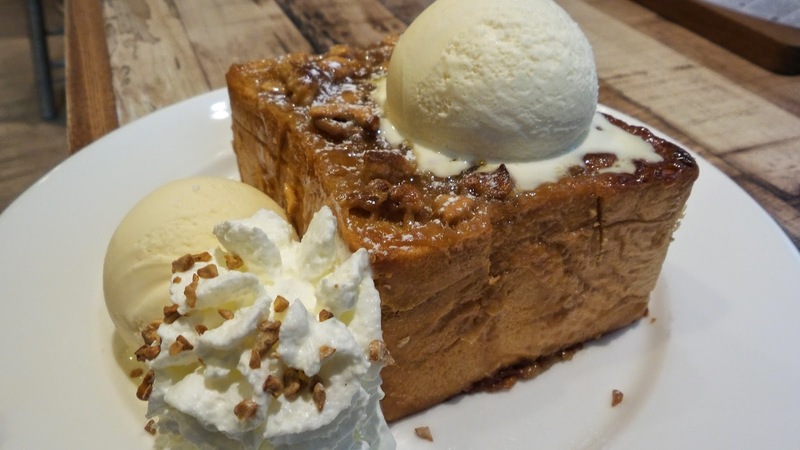 The toast is made fresh and served with two scoops of ice cream. 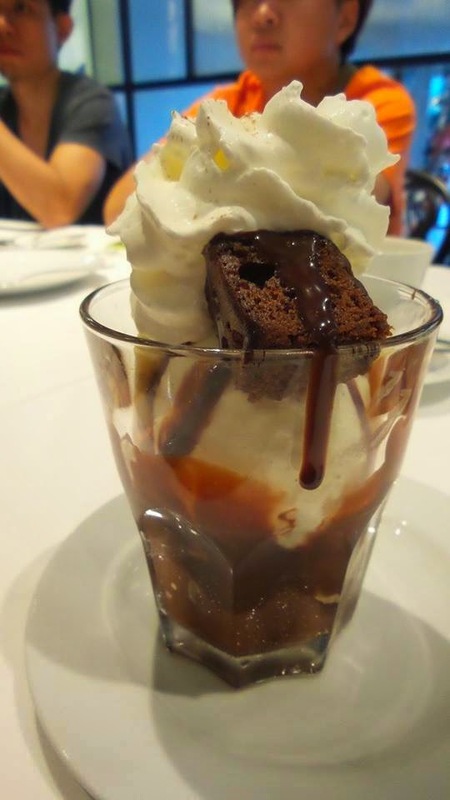 Whilst the chocolate lava cake was served with 3 scoops of ice cream. Both had their plus points but go for the toast and if you have more stomach space, you can try others. Come here in the early morning and later in the evening to grab cheap and good deals without having to squeeze with the hungry shoppers who are there to get the best buys. It is the cheapest wholesale market for mostly clothes. Few repeated shops which is one thing i like about going to Pratunam and you will never walk past the same place again even after 2 hours of shopping. The place is huge and it extends to a new shopping area called the Baiyoke shopping so all the more you have to set aside time to come here. 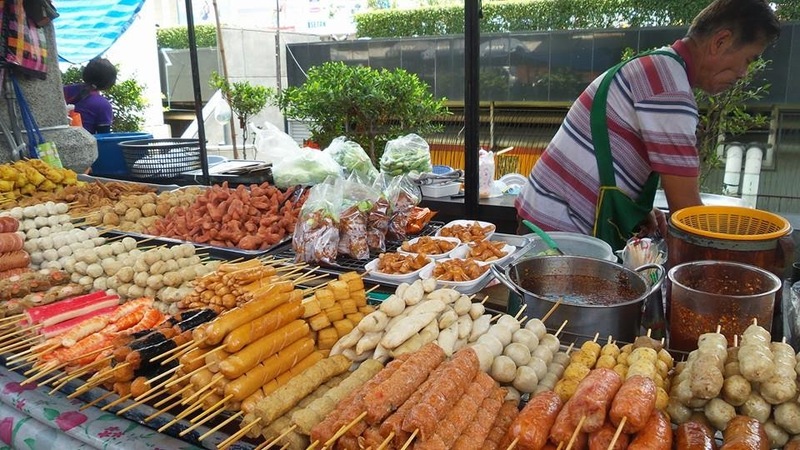 Roadside stalls selling snacks and local thai food can be really tempting you have no choice but to get it. If you are in for some aircon shopping, Platinum Shopping Malls will give you endless opportunities for that. 2 buildings linked by a walkway on the Second Floor, you will need to spend an average of 2 days to complete the shops here. Unless you are a selective shopper, but try to give yourself sufficient time and plan your routes to cover as much as possible. Prices here are about twice that at Pratunam Market but you need to only buy 2 pieces and above for the wholesale price. Bargaining here is more common though because the prices are marked up. 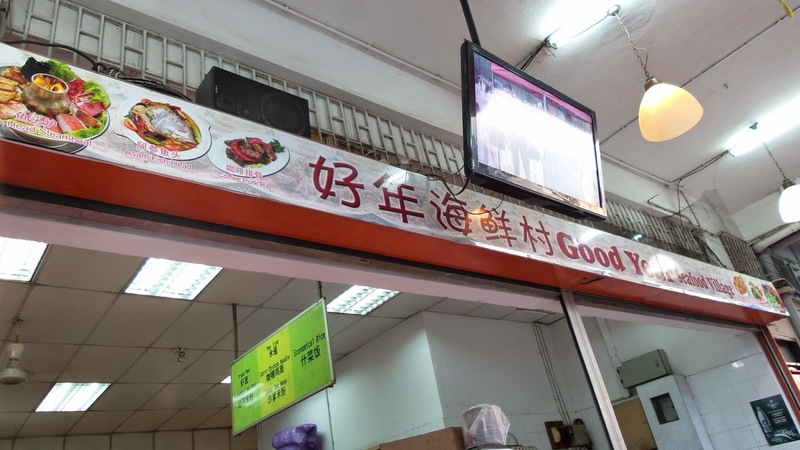 I heard the foodcourt is pretty decent but has yet to try it. So if you are hungry from shopping, do give it a try! I went there for the first time being a bit skeptical as i have never wanted to shop at a wet market more so on a holiday. But i was wrong, this fresh food market is really impressive. I was gasping and wowing like i have never seen fruits, meats and fish stalls before in my life. Pictures below will be able to tell you more. 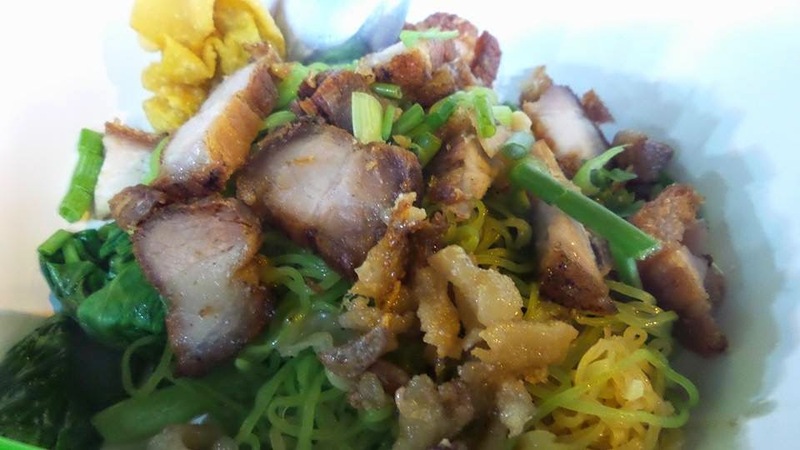 There is a hawker area at one end of the market with about 20 stalls selling various food from oyster omelette, phad thai, fresh fruit juices, coconut pancake, wanton noodles so on and so forth. Try the oyster omelette from Stall 11/40 and fruit juices from 10/9. Whether you are there for Melissa shoes, Naraya or Cath Kidston, they have it all in store within CentralWorld. It is really huge, even bigger than Vivocity i would say. And now they have a new extension to it called the Groove where there are new F&B outlets apart from those in CentralWorld. From L1 to L7, there are shops ranging from local brands to departmental store (ZEN) to the high end ones like LV. The foodcourt here is nice too! They used to have fish maw soup but has since been removed from the menu :( Really a place to go whether you're with friends or family. There is surely something to buy, eat or do here! Alight at MoChit Station if you are going via BTS or go straight to Chatuchak Station via Metro which brings you right within the weekend market. YES, it is a weekend market so it means if you do not visit on a Sat or Sun, you will have to miss it. This is presumably the largest weekend market in the world. 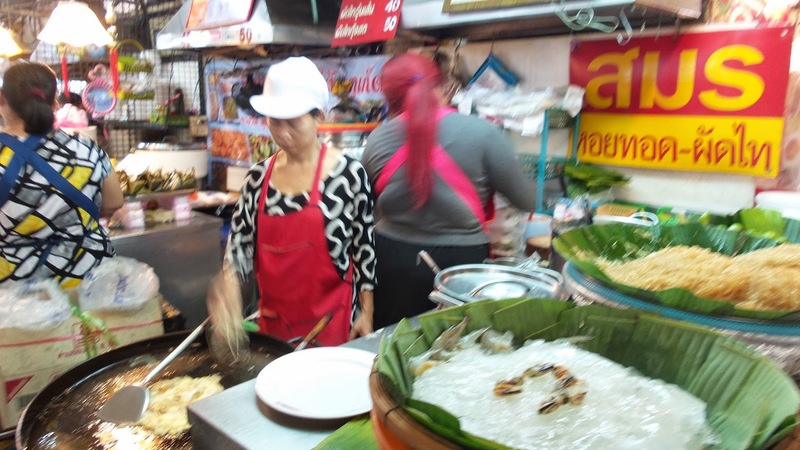 Some said they need two days to cover but honestly, there are many repeated stalls here in Chatuchak. I have a problem finding the Soi number which we would like to shop but it was such a headache especially under the scorching sun. Not a preferred place if you are there with family or kids as it can get too hot and frustrating to walk. 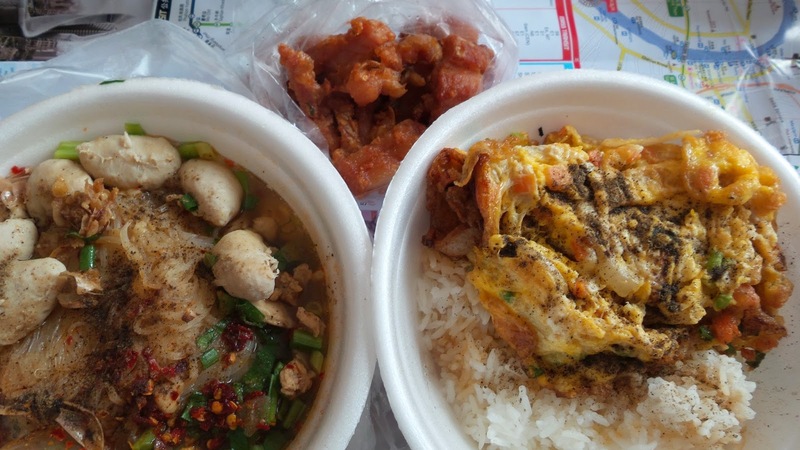 Food is mostly located at Sections 1 and 2 (near Khamphaenpetch MRT Station). However, you will notice sparse stalls selling snacks and drinks everywhere in the market. You are bound to eat or drink as you shop because it can really be draining. 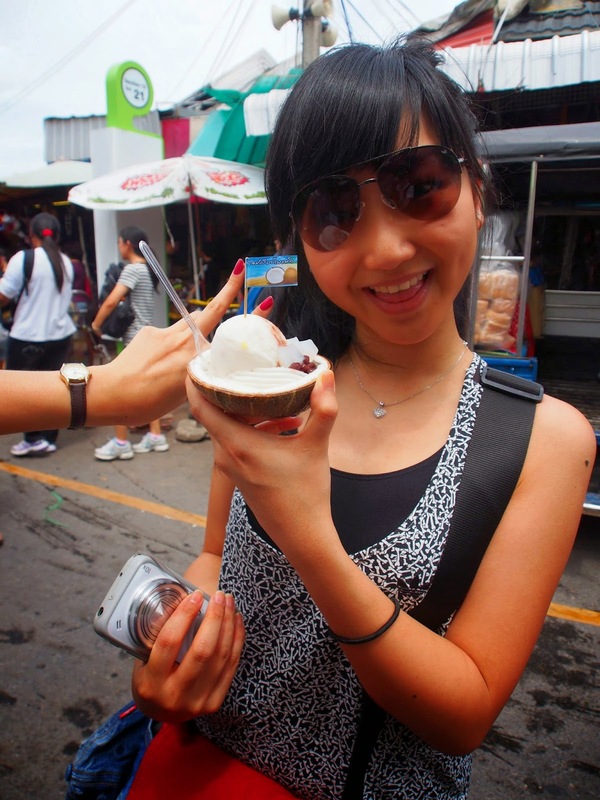 Must tries are the Coconut Ice Cream (30baht), where you will spot every few hundred metres away, and fresh fruit juices (ranges). Go to this mall for their foodcourt and photo taking. Every floor has a theme and even their toilets are dedicated to the theme which is a country. For instance, if you are heading to Tokyo, the entire floor will be filled with shops selling Japanese goods and statues like sumos for you to take photos with. Rather interesting concept but they are expensive of course. Not practical to buy anything from here. Pier 21, the foodcourt is just like any other foodcourts in Bangkok where you have to purchase a card to buy your food. Amazingly, the food here is even cheaper than roadside stalls while the standard is decent. I like it because there are many choices and even drinking water dispenser. We went a couple of massage places from my past 2 trips. Service varies but if you are not looking for top notch service. I would recommend Sabai Massage and one at Amarin Plaza (linked to Erawan Shrine). Located at Petchburi Soi 15 which is just right beside my hotel. Besides its prime location, the rates are comparatively cheaper than those in malls. Foot massage and thai massage are at 200baht per hour. Service wise, they are very friendly and not stuck up like the other down the road. They also soak and wash your legs before bringing you to your respective stations. I remember when the curfew has yet to be lifted they would tell us not to worry and that they are open past 12 as long as there are customers. We went Number One a few times late at night but they chased us out saying they would need to close soon due to curfew. The last time we went earlier, we managed to try it out but the masseurs were one of the worst we have encountered. Firstly, they were not serious at work, laughing away and commenting on their customers. Secondly, we were not given warm water to cleanse our feet before wearing their shoes. Finally, they either have not eaten for days or their skills are just insufficient. In all, i would not recommend to go to this place. Well i guess for this i can only share my opinion on two hotels which i have stayed in my memories of Bangkok. Linked to MBK Mall, it is a 5-star international hotel with a good location. We stayed there two years back and i still would want to go back there if i had the choice to stay in a luxurious hotel. The downside would be that there is no wifi in your room but you may head down to the lobby for free wifi. 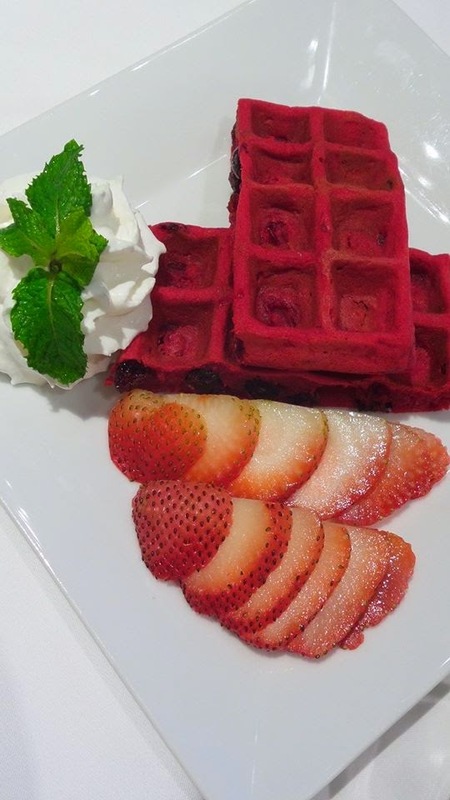 Book your rooms with the breakfast buffet and the hotel's cafe. We look forward to it every morning. 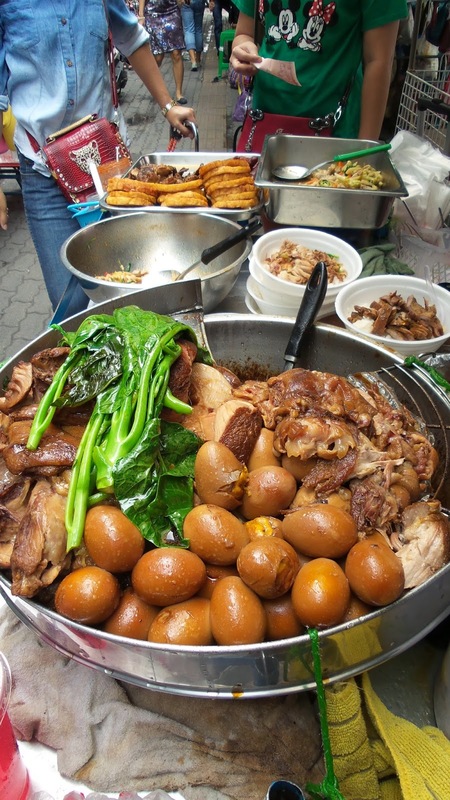 They have a wide variety of international spread to fill your tummy for the day of activities. Only thing is that you might have to miss out on some meals because you would be too full. My advice to you is to eat a few types on one day and cover all the food over a few days rather than trying to squeeze everything in a morning. 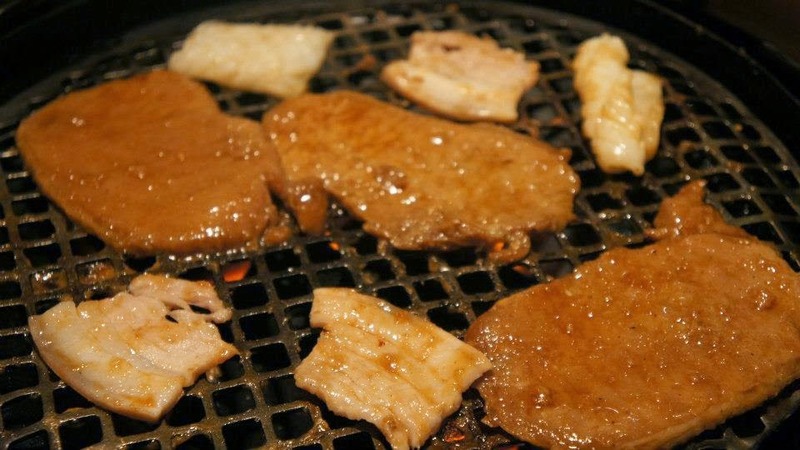 There is a Korean BBQ Restaurant called Kongju which is fine dining but you are bound to love the undivided service and delicious food served. Room rate will be about 150SGD per night for 3 person. Located at Petchburi Soi 15, it is just 5 minutes walk to Pratunam Market, Platinum Shopping Malls and about 10 minutes walk to Central World. Ratchatewi BTS Station is also about 10 minutes walk from the hotel. Hotel rates here are around 60SGD per night for a double bed room (additional bed at extra cost). Wifi is strong in the hotel rooms and lobby. Get yourself a cuppa iced chrysanthemum tea or hot coffee at the lobby to kickstart your day (Complimentary for hotel guests). 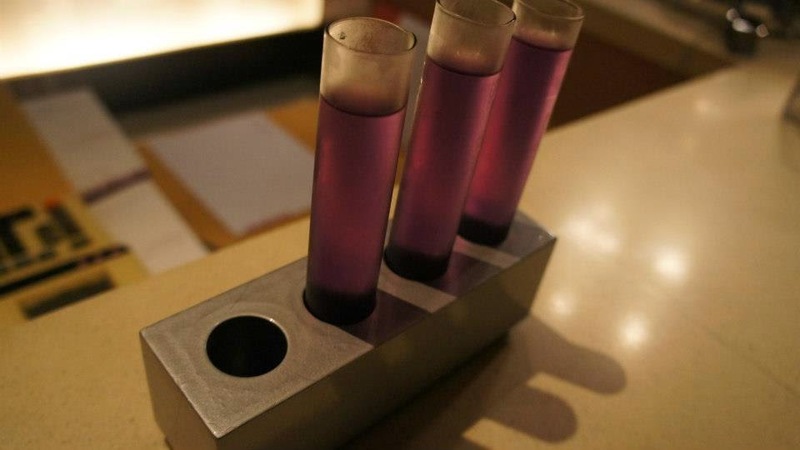 Service here is pretty pleasant for an average hotel. It is somewhat like an apartment as the rooms are divided into the kitchenette area and the living room. Preferred for families and large group as it is not the dimly lit and cosy rooms couple would prefer.